WASHINGTON (AP) C.J. McCollum shook off foul trouble and the memory of some recent late misses to prove his clutch ability again on Saturday night. Damian Lillard led with 29 points for Portland, which trailed by 17 points early in the fourth quarter, a night after another dramatic 127-125 victory at Brooklyn on Friday. Jusuf Nurkick had 17 points and Noah Vonleh grabbed 10 rebounds for the Blazers. But after some late misses earlier this season, it was McCollum who scored 24 of his 26 points after halftime, and 13 in the fourth quarter, while playing the last 8:53 with five fouls. His contested 20-foot fadeaway gave the Blazers a 106-105 lead for good with 21 seconds left. Earlier this season, McCollum missed two of his last five free throws in a 104-103 loss to the Los Angeles Clippers on Oct. 26, and a potential game-winning jumper in a 98-97 loss to Memphis on Nov. 8. Bradley Beal scored 26 points and Otto Porter added 24 points and 10 rebounds for Washington in the first game of what the team expects to be a two-week stretch without All-Star John Wall. The point guard received injections to treat left knee inflammation earlier Saturday. Beal missed a jumper to give Washington back the lead with 6.5 seconds left and a potential game-tying 3-point attempt at the buzzer. 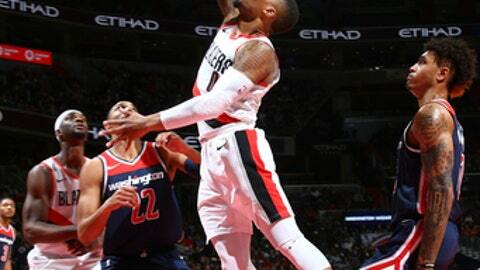 The Wizards led 94-77 before Portland put together a 20-7 run to close within four, and still had a seven-point lead when Markieff Morris was called for a flagrant foul with 1:32 to play. Nurkic hit one of two free throws to make it 105-99. Then McCollum hit a 3-pointer, a runner, and then the fadeaway over Porter’s outstretched arm, giving the Blazers their first lead since the first quarter. Pat Connaughton added two free throws with 2.6 seconds remaining. Wall, 27, received platelet-rich plasma and viscosupplementation injections earlier Saturday in the hope of reducing his knee inflammation. A team statement said the injury occurred when Wall made knee-to-knee contact with another player during a Nov. 7 loss to Dallas. Wall had previously said fluid on his knee built up after he received IV fluids to deal with illness and migraines before a win against Atlanta on Nov. 11. With Wall out, Portland’s backcourt of Lillard (25.2 points) and McCollum (21.8) is the only healthy NBA tandem with two players averaging more than 20 points. Beal (24.1) and Wall (20.3) were the other. Trail Blazers: Coach Terry Stotts started Lillard, McCollum, Nurkic, Connaughton and Vonleh on back-to-back nights. They hadn’t started together before Friday. … McCollum picked up his third personal foul with 8:05 left and finished the first half with two points after playing only 12 minutes. … Stotts celebrated his 60th birthday. Wizards: Tim Frazier scored seven points in the first quarter before besting his previous season high of 10 with a jumper midway through the third. He finished with 11. … Washington received two technical fouls in the third quarter. Trail Blazers: Close a three-game East Coast trip at the New York Knicks on Monday. Wizards: Visit Minnesota on Tuesday to continue a stretch of 10 of 12 games on the road.